The Norton Summit Hill Climb greeted us with another morning of fine weather. However, for the second year in a row, the four cylinder vehicles are the only ones showing up. When we ran this climb for the first time, I was apprehensive about the smaller vehicles being able to make the climb. On that first climb though, David Radloff rocked up in his one cylinder Rover and was able to take the hill easily, just not as quick as the others. A bit like the Siddeley Deasy! People are now realising that they should hit the hill before I get out there in the Siddeley Deasy. Three other cars had to travel at about an 18 minute pace because they couldn’t get past the Deasy! Congratulations to Fiona and Ilona for winning the day’s trophy in the Dodge Brothers by showing the most enjoyment in going up the hill. Another beautiful run and picnic lunch in the hills. Thank you Neil. If you have any suggestions or issues with this event, please pass on you concerns to someone on the committee. Or is it just a case of ‘been there, done that’ and let’s have something different? 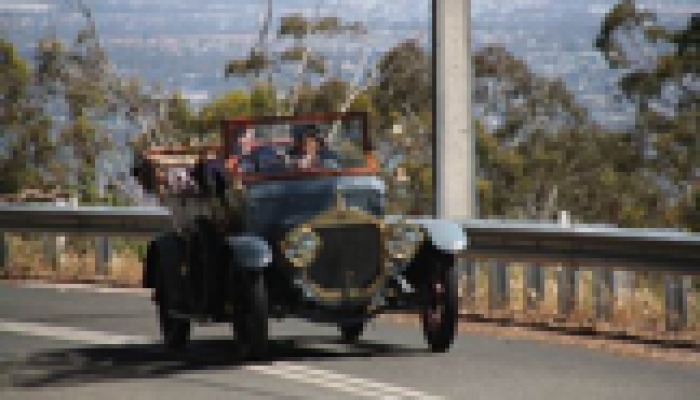 If it is, come in whatever car you prefer and enjoy the picnic at the Mount Lofty Botanical Gardens next year, joining us either before or after the climb.